Intermix has killed it with their new spring 2015 look book. Think an ode to nautical fashion with current clean lined styles and 70s inspired (think the current fringe trend) blended in effortlessly. I've always been a fan of fashion photography, and look books are a great way for a brand to communicate their collection message through images. Working in lifestyle and fashion pr, one of the favorite parts of my job is helping a brand develop their persona visually. In fact, stay tuned for a behind the scenes look at the Sophie Simmons for Diamondère collaboration look book shoot I helped direct a couple weeks ago:). Back to the look book at hand, Intermix combined calming tones of cream and navy peppered by vivid pops of orange and earthy greens and free flowing forms with more structured pieces. 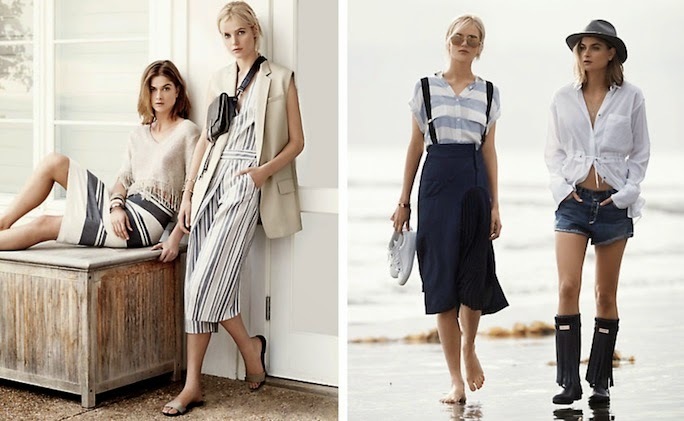 All in all, they created a look book full of styles that are equal parts weekend at the shore, fashion business and laid back luxe. If you weren't inspired enough to go spring wardrobe shopping there is a bonus, Shop online and save up to 20% on new spring fashions through this Intermix sale! What will you be buying? See the entire lookbook here. And don't forget, you can save up to 20% on new spring fashions on Intermix's sale!